Sunny Vegas … that's a ride on the highway with a beer on your lap, with music for the essentials: Love, Life and Rock'n Roll. Isn't that wonderful? 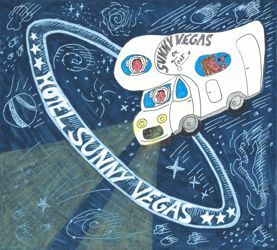 Sunny rubbed his eyes in disbelief and rocked on until 2018 … well, and a few weeks ago he brushed the dust off the 8-track and here we go: Let there be „Hotel Sunny Vegas“ … once again the big break is instantly ahead, isn't it?